Here’s an update to holiday traffic numbers for December, as well as news and notes including holiday entertainment and travel tips from the Port of Seattle. Unlike some other places around the country, this is not the busiest time of the year at Seattle-Tacoma International Airport, but sometimes it can feel like it. Why? Sea-Tac doesn&apos;t have as many overall passengers but they do have a lot of inexperienced travelers who may only fly once or twice a year – inexperience can back up checkpoint lines. Plus, picking up relatives for the holidays means more traffic on the airport drives [see tips below for picking up out-of-town arrivals]. Friday, Dec. 20 (95,000), Thursday, Dec. 26 (93,000), Thursday, Dec. 19 (90,000), and Saturday, Dec. 21 (90,000). As usual, the lowest traffic numbers will be the holiday, Wednesday, Dec. 25 (69,000) plus New Year’s Eve (66,100) and New Year’s Day (69,000). An average summer day (June-August) will see over 100,000 passengers and is the peak air travel time for Sea-Tac. August is traditionally the busiest month of the year followed by July, June and May (December is 7th, November 10th). For 2013, through October, passenger traffic is up 4.7% over 2012, including a 10.5% rise for international traffic. That trend will result in another record year at Sea-Tac with a projected total over 34 million! 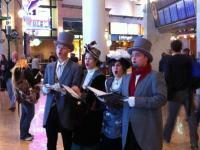 Annually sponsored by the Merchants at Sea-Tac Airport, the Holiday Entertainment Program provides live performances and musical entertainment from Dec. 16 – 24, during peak passenger traffic hours of 5 a.m. to 6 p.m. Delight in various holiday entertainers and performers, such as Santa Claus and his elves, carolers, jugglers, character actors, roving game teams, and many musicians (singers, pianist and saxophonist) throughout the entire terminal. Find the schedule for all of the fun! Wrap Gifts Before You Fly! Wrapped gifts may need to be opened by security in order to take a closer look, so consider the two gift wrapping stations post-security. From 6 a.m. to 2 p.m., YWCA and USO Northwest volunteers will be in the central terminal and on concourse A in the vicinity of the escalators to the south train station. Donations to the organizations are welcome. Sea-Tac will continue a series of actions implemented last year to reduce the congestion on the airport drives, from adjusted signage to traffic metering by Port of Seattle Police. Of significant note, shuttles for the Rental Car Facility have reduced the number of vehicles on the drive by 160,000 each month or 1.9 million for the year. THINK OPPOSITE! Pickup on the departure drive, drop-off on the arrivals drive – If traffic is congested, look for the opposite airport drive for relief. Try meeting your arriving guests one level up from baggage claim at the less-crowded departure drive. Those with only carry-ons can go straight out the ticketing level. For drop-offs, reverse it. Go to the arrivals drive and travelers only have to go up one level to ticketing. Remember, the busiest periods are mornings for departures and evenings for arrivals. Don’t get stuck in traffic! -- Park on the Terminal Direct floor of the airport parking garage, the quickest and most convenient option for meeting passengers in the terminal, and pay just $4 per hour. Or use any other floor for $3 per hour. Try the cell phone waiting lot -- Parking in this lot is free and drivers can wait up to 30 minutes until arriving passengers have deplaned, collected luggage and called to be picked up outside of Baggage Claim. Take advantage of the posted QR code to scan for the most recent flight arrival information. Remember, there is no parking or waiting allowed on the airport roadway shoulders. Everyone is gearing up for the busy holiday travel season at Sea-Tac, so plan ahead to beat the airport traffic and enjoy extra savings on regular parking rates! Now through Jan. 15, 2014, take advantage of holiday parking deals and park for only $99 a week (up to seven days) in General Parking. Minimum 4 day stay required. Sign-up now to get your coupon from the airport website. Sea-Tac’s parking rates are all inclusive, without additional charges or fees, and no shuttle to slow you down. If you haven’t visited recently, be aware to follow the signs as a few ticket counters have moved, along with their gates, due to airline realignment. The biggest to note is United Airlines moving from their long time north end location on the ticketing level to the south end with their gates now on the A concourse. Enjoy the “Best Arrivals Experience” honored by the Future Travel Experience Awards recognizing Sea-Tac Airport’s Experience the City of Music program. Check online for a schedule of live northwest musicians entertaining in various locations and get more details about this unique showcase of the region’s music culture, including a new Jimi Hendrix exhibit from EMP. Take the Sea-Tac Airport Art Walk for a little exercise and education in public art. The free, self-guided tour takes you ½ mile (one way) through more than 16 permanent art installations and rotating temporary exhibits. QR codes guide your way and provide artistic information. Forgot to empty your liquids? At checkpoint 3, look for the liquid drain and keep your favorite container through security. Then when you get to the other side, fill back up with the water bottle filler in the central terminal food court. Self bag tagging is now available in a common use kiosk for Hawaiian Airlines right across from the international ticket counters. Get your boarding pass and your bag tag on your own! For users of electronics, take advantage of more than 300 new power plug-ins attached to seats at gate areas throughout the south satellite and concourses A, B, & C. More are coming and you can use it to check out our FREE WiFi throughout the terminal. Questions? Lost? Pathfinders, dressed in red, and volunteers , in blue, are available seven days a week throughout the terminal using iPads to help travelers with quick information. Don’t forget other amenities to enjoy your trip -- rocking chairs in central terminal, the salmon walk on concourse B, a kids play area where concourse B and A come together, find the talking water fountains, and visit the Quiet Zone at gate B4. See more under Passengers Services. More green projects have taken off and you can see them right outside the window of the gates. Centralized Pre-Conditioned Air will save millions of dollars and thousands of tons of greenhouse gasses. Find out more in our projects page. Find out about new concessions options, construction, and news at Sea-Tac Traveler Updates. Confirm your airline details – Contact the airline that you are traveling with (not the airport!) to confirm your flight information, the name on your boarding pass, and to request any special services like wheelchairs or luggage assistance. You can find your airline’s contact information here. Pack with Security in Mind – Know what is and isn’t allowed in carry-ons and checked luggage by checking the TSA website. Try their prohibited items checker app here. Check your boarding pass for Pre-check! – TSA has new rules on Pre-check which means US Citizens could be randomly selected for expedited (leave shoes and coat on) screening at security checkpoints! For more information, visit TSA’s informational website here. Check the status of your flight online or via email notification – Check the flight status page for updates online or through email alerts. Arrive at least two hours before your flight – Give yourself time to get through security. Your airline may request that you arrive earlier – make sure to ask. Park in the Airport Garage – Save time, stay dry and be close. No shuttles and covered skybridges provide the most convenient parking located closest to the airport terminal. Sea-Tac Airport partners with the Thanks Again loyalty program to offer airline miles when you park in the airport’s ParkSmart garage or make a purchase at any of our airport merchants. Register today and earn airline miles for purchases you already made at the airport. Enrollment is free and when you register by texting FLYSEATAC to 82257 you will receive 100 bonus miles! Find more information on these and other travel tips for those heading to the airport or picking up passengers on the Port of Seattle&apos;s website.